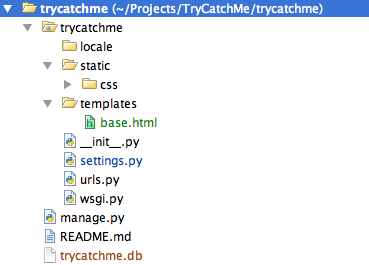 Reference to trycatchme.db file can't be resolved by PyCharm. In Django 1.4 project structure differs from project structure in Django 1.3 (please, see screenshot in attachment). As you can see, trycatchme.db is created in the root directory, near manage.py, and setting.py is now locates in child directory. In Django 1.3 manage.py and setting.py were located in one directory (and manage.py created .db file after syncdb in the same place), so there were no problems with reference resolving. How to fix it for 1.4? Tried to execute task makemessages (with Alt+R menu). Faced with exception. It executes task from parent directory (where manage.py lives), I need to execute it in child (where setting.py locates). Can I set it somehow?